Dr. Salil Midha and Dr. Dinesh Patel, two well-respected physicians in the New England area, were honored for their work and contributions at the Indian Medical Association of New England's 35th Annual Meeting at the Burlington Marriott Hotel in Burlington, Mass. 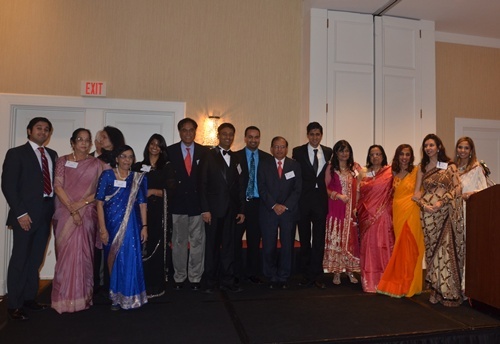 Midha, who recently completed his 25th charitable mission to Africa, was presented with the 2013 Community Service Award at the November 23 event while Patel, who serves as the chief of arthroscopic surgery at Massachusetts General Hospital, was honored with the 2013 Distinguished Physician Award. Apart from Midha and Patel, other prominent individuals present at IMANE's November 23 event included distinguished guests Devyani Khobragade, Consul General of India in New York, Vikas Sukhatme, Victor J. Aresty Professor of Medicine at Harvard Medical School, Jayesh Shah, president of the American Association of Physicians of Indian Origin, and Ravi Jagirdaar, AAPI's president-elect.